Portions of the proceeds for all shows benefit the 2017 ArtsEZ Grant Round administered by the Northampton Arts Council. Ticket Outlets: Brown Paper Tickets - http://silverchordbowl.brownpapertickets.com or call 1-800-838-3006, State Street Fruit Store in Northampton, Cooper’s Corner in Florence, A.J. Hastings in Amherst, Elmer’s Store in Ashfield. The first Sunday in February will be devoted to the 33rd Silver Chord Bowl, the oldest and most respected collegiate a cappella show case in the region, hosted in John M. Greene Hall on the Smith College campus. This years event will begin with a performance by Northampton High School’s very own Northamptones, followed by performances by 6 groups from colleges and universities around the Northeast. 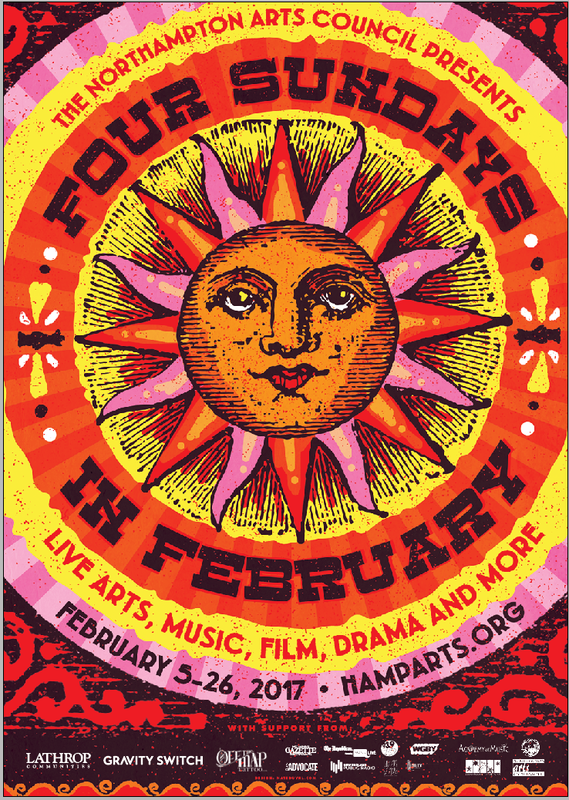 This year we will see the Dartmouth Aires, the Boston University BosTones, Tufts sQ!, the UMass Dynamics, the UMass Doo Wop Shop and the Smith College Noteables. The Silver Chord Bowl 2017 will be hosted by Smith College President Kathleen McCartney and Northampton Mayor David Narkewicz. New Century Theatre actors perform a scripted scene line by line while Happier Valley Comedy improvisers walk into the scene for the first time, performing their parts out of thin air. Love walks into the room, and you never know what's going to happen next! Guess they'll have to make it up. Based on Happier Valley Comedy's popular SCRIPTED/UNSCRIPTED show, this unique performance captures that great lover's leap into the unknown. Will they swipe left or right? Make a love match or wind up in divorce court? Nobody knows how these love 'em or leave 'em stories are going to turn out until the lights go up, the scripted actors meets eyes with the unscripted improvisers, and the sparks fly. One thing is for sure, Shakespeare had it right when he wrote, "The course of true love never did run smooth.” But it does run hilariously in MAKING UP LOVE. 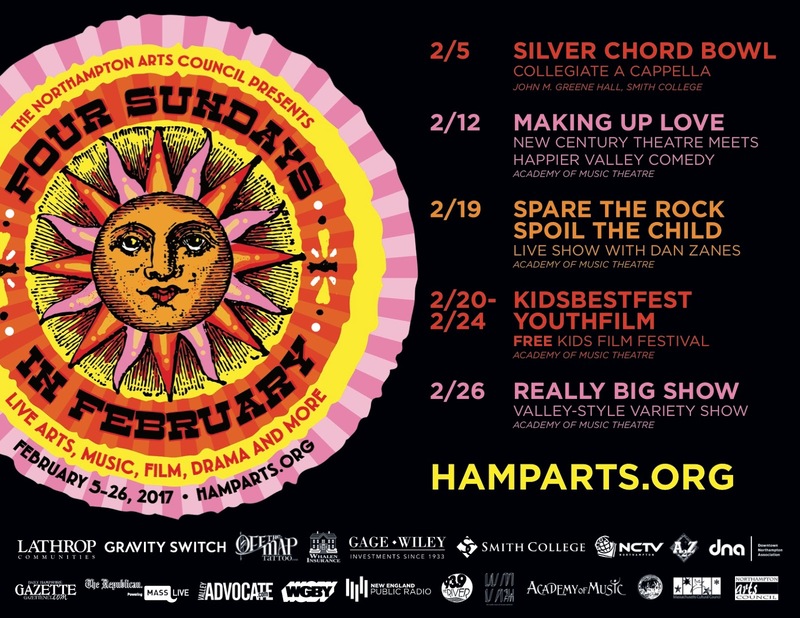 Featuring Happier Valley Comedy Improvisers: Scott Braidman, Maureen McElligott, Laura Patrick, Maile Shoul, Christine Stevens, Pam Victor and New Century Theatre Actors: Lisa Abend, Stephanie Carlson, Cate Damon, Sam Rush, Sam Samuels. Spare the Rock, Spoil the Child Live! 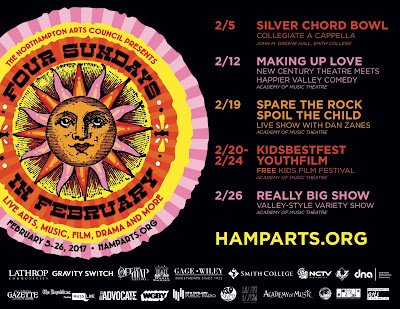 A special live presentation of the nationally syndicated radio show Spare the Rock Spoil the Child, a show for kids and their adults, on stage at the Academy of Music in Northampton, MA on Sunday February 19th, 2017. This all-ages family event will celebrate LGBTQ youth and the legacy of David Bowie through story, songs, poetry and conversations. 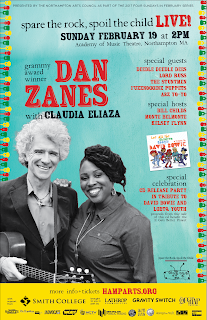 Featuring Grammy-winning performer Dan Zanes, The Deedle-Deedle Dees, Lord Russ, The Stuntmen, Abbie Morin, Henning Ohlenbusch, Katie Mullins, Calvin the Really Big Puppet and modern Yo-Yo skills by Eric Koloski and the A2Z Science & Learning Store. 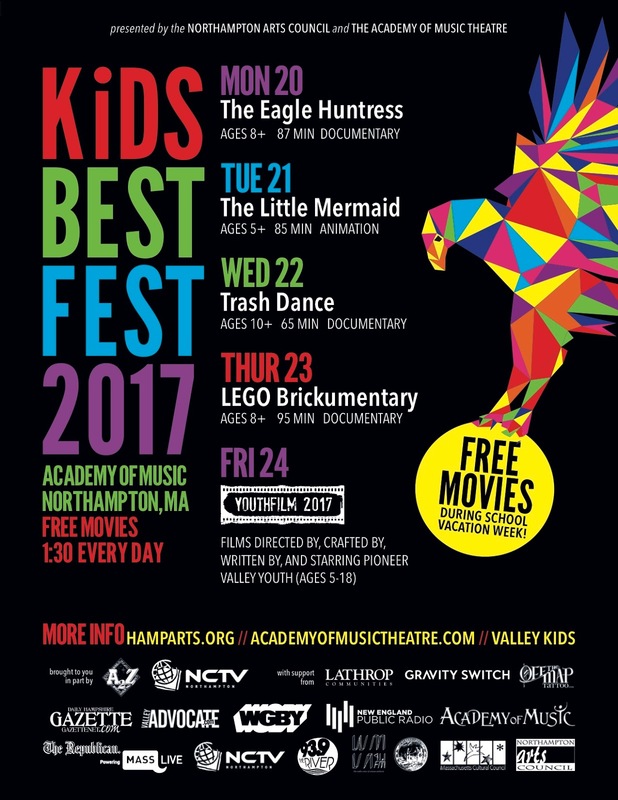 KidsBestFest is a dedicated FREE children’s film festival. 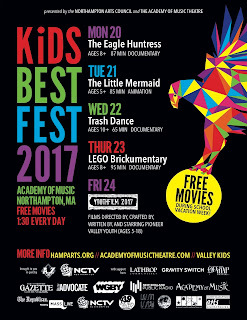 The week also includes YouthFilm Festival, films made by local youth who are at the beginning of their budding careers. The participants are able to see their films on the Academy of Music’s large screen in a theater setting. All films start at 1:30 PM. 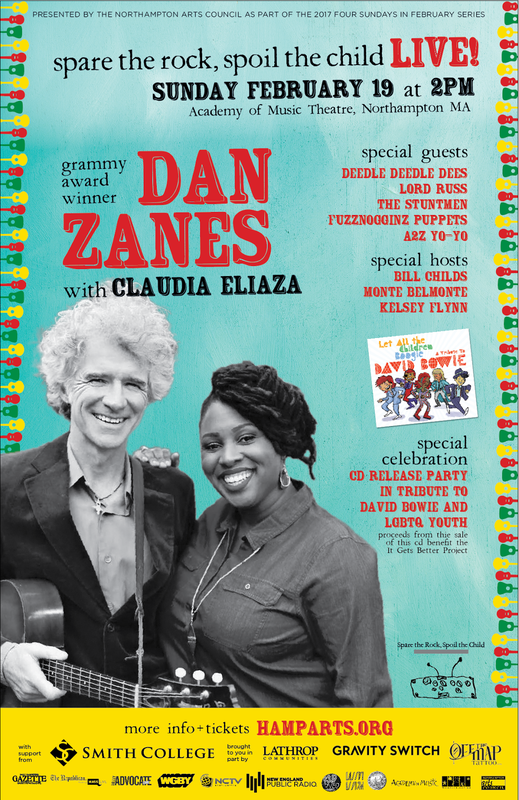 A showcase of the best local talent in the Valley’s favorite variety show at the communities’ most beloved theater. 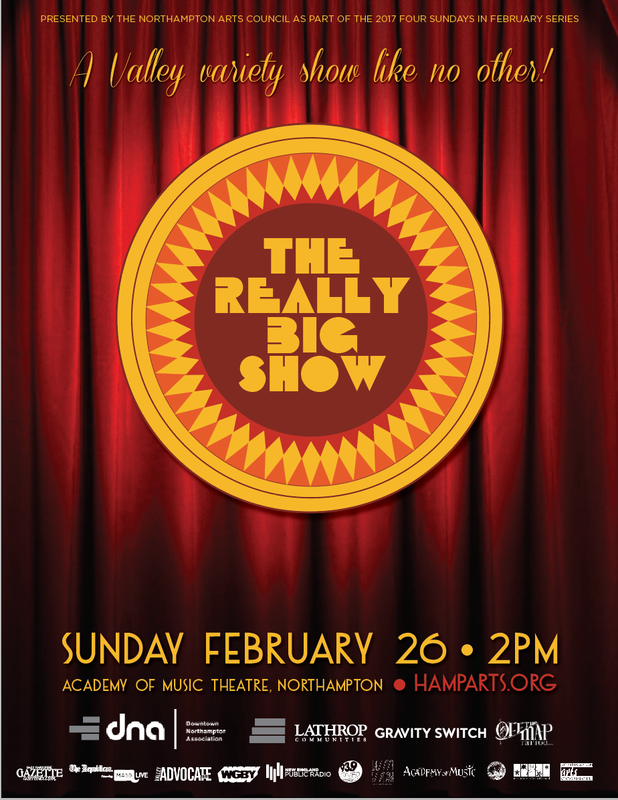 Steve Westfield of the Pajama Slave Dancers will host with the Really Big Show orchestra led by Jim Armenia. Fuzznogginz will be on hand featuring our newest character, Calvin the Really Big Puppet. Northampton High School Theatre students will serenade us with a song from their upcoming production The 25th Annual Putnam County Spelling Bee. Our featured band this year will be Workman Song, performing their recent radio hits including “O, To Be In Love Again.” Poet Amy Dryansky will make her first appearance in her new role as Northampton's Poet Laureate. Also featured this year, the violin mastery of Nicky Whittredge, the experimental dances of Loculus Collective, and a Gong! Enjoy witty quips by our celebrity judge panel featuring Rhymes With Orange cartoonist Hilary Price, Monte Belmonte, and someone special.